SAN FRANCISCO —From Soweto to San Francisco, the music and dance of South African townships have arrived in American cities. In part the legacy of colonialism and its mutant offspring apartheid, this cultural infusion is providing a welcome alternative to America’s tedious, top-forty pop music. Two groups, Zulu Spear and the U-Zulu Dance Theater, both headed by South African singer and dancer Sechaba Mokoena, are in the forefront of this cross cultural phenomenon. Mokoena joined the rapidly expanding list of apartheid’s political and cultural refugees in 1981 when he came to the United States with a touring company of the popular South African musical Ipi Tombi. The show, as Mokoena relates it, was a reflection of the schizophrenic system under which it was produced. Using material written primarily by black musician Andy Chabede, white producer Bertha Egnos and her daughter Gail Lakier contrived a profitable but hopelessly inaccurate portrayal of black South African life. Nevertheless, Ipi Tombi provided one of the few venues for black artists to display their talents—albeit for low pay and before segregated (usually white) audiences at home—and many including Mokoena took advantage of the opportunity. “I joined it because really I wanted to get out from South Africa. I knew that’s my passport, my ticket, to get out from South Africa.” Las Vegas and Reno in the state of Nevada were the first stops on the company’s American tour. The show played there for several months without incident but when it moved on to Houston, Texas, anti-apartheid demonstrators forced it to close down. Many of the performers chose to return home to South Africa, but others, including Mokoena, sought political asylum in the United States. A few of those who remained in the U.S., Mokoena, Mubi Mathunjwa, Barbara Mdomo, Matume Thuti, Dingane Lelukwane, and Thamsaqana Hlatshwayo, formed the U-Zulu Dance Theater and began performing a musical show they called Our Pride, a far more authentic portrayal of black South African life than Ipi Tombi had been. The story tells of a rural villager who is forced to move to the city to find work when his land and cattle are appropriated by white settlers. In the city the man runs afoul of the notorious pass laws and is deported back to the countryside landless and broke. The group played in Houston for nearly a year and then moved on to California settling in the San Francisco area. A new member, Basie Mahlasela joined along the way as the group began to play before larger and larger audiences. American dancer Michael Alexander of the San Francisco Ballet was so impressed that he agreed to become the group’s manager. By 1983, the U-Zulu Dance Theater was well established. Also performing in the area was Nigerian saxophonist Orlando Julius Ekemode with his band Ashiko. He and Mokoena teamed up on certain dates with U-Zulu and Ashiko performing together, producing phenomenal shows. African music gained legions of new followers because of the performances of these two groups. Late in 1984, however, Ekemode returned to Nigeria to do some recording, and the pairing came to an end. With Ekemode gone, Mokoena decided to try putting his own band together to continue to nurture the expanding audience for African music. The effort paid off with the formation of Zulu Spear, fronted by Mokoena and Mathunjwa singing and dancing backed by a band of Americans from the schools of rhythm and blues, rock and roll, and funk. The fusion has produced exciting music. The predominant sound is mbaqanga of South Africa. Interwoven with it are the rhythms of earlier generations of African expatriates, the R & B, funk, and rock sounds that evolved in America from the days of slavery. 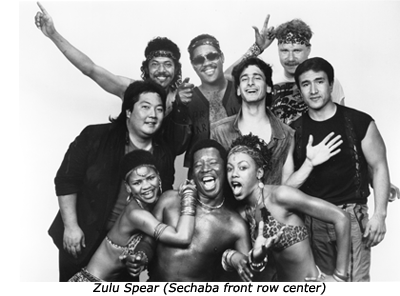 The cross cultural mix has been dubbed “world beat” by local commentators, and Zulu Spear and other bands of similar persuasion have been quite successful. The term “world beat” is particularly applicable to Zulu Spear, which is a truly diverse collection of musicians. In addition to the South African contingent, the group includes guitarist Matthew Lacques of Italian descent; Sergei Shkurkin, a keyboard player of Russian extraction who spent some time studying and performing in Kenya and South Africa; Puerto Rican rhythm guitarist Larry Valle; Philippine bassist Clarence Barrow; Rick Yamashiro, a Japanese-American saxophonist; Afro-American drummer Jerome Leonard; and Veronique Wilson, a singer and dancer of Creole descent. Mokoena is encouraged by the success he has enjoyed, but he remains haunted by the torment of his people back home. A Sotho, he grew up in the harsh environment of Soweto, the sprawling black township on the outskirts of Johannesburg. His father was a carpenter in the township, and his mother worked many years as a housekeeper for whites in the area with the ironical name Orange Free State. As a youth he was captivated by show business and dreamed of one day becoming a performer. His first break came while working as a roadie for the Flaming Souls when the band invited him on stage to dance. He went on to perform in several South African musicals including Meropa and Two Faces of Africa.